"Makes our lot seem positively tame doesn't it". Ok now your turn. Best quote published tomorrow. Sculptor/artist Ai Wei Wei has been detained by the Chinese authorities. His work of twelve zodiac heads is currently on display at Somerset House. 'Did you shoot all of these yourself? I love seeing public art. These aren't going to make my top ten list, but they do make a person look carefully, don't they? 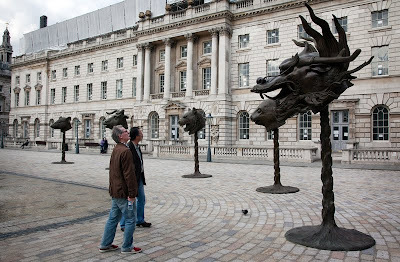 I had heard a bit about Ai Weiwei but did not realise he was a sculptor and artist. I had only known that he was an outspoken dissident. He is very talented! I hope that the Chinese government comes to their senses soon and bow to pressure to release him. I was born on the year of the horse, but I still want that dragon head for my house! "I think it's trying to say something."